How to import to Nigeria? Explain about import registration process, cargo movement to Nigeria from overseas countries, Import delivery process in Nigeria etc. What are the import procedures in Nigeria to move goods? 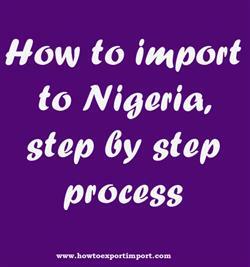 This post explains about step by step procedures that need to be finished with Nigerian government authority for importation to Nigeria. Nigeria Customs Service was saddled with the responsibilities of revenue collection, accounting for same and anti smuggling activities under the supervisory oversight of the Nigerian Ministry of Finance. They controls the imports and exports activities happening in the country. This post explains about different phases in import process that every importer needs to go through in Nigeria. Procedures required to import to PORT HARCOURT . Requirements to import to Kano. Clarifications to import to APAPA. How can I import to LAGOS. What should I do to import to APAPA. How to import to TINCAN ISLAND? Formalities for import to PORT HARCOURT . Procedures to import to LAGOS. Need to import to Sokoto. Explain to import to Port Harcourt. Information to import to Enuguf. Step by step process to import to TINCAN ISLAND. Methods to import to Enugu. Guidelines to import to Calabari Please guide to import to Port Harcourt. Help to import to.